Cooking doesn’t have to feel like a daily responsibility, and meals don’t have to be repetitive. We can rethink our approach and view cooking as an opportunity to creatively bring our favorite foods and flavors together to prepare a delicious meal. It doesn’t have to be a fancy, gourmet dish, and it’s possible to create a memorable meal with just a few ingredients if you put your heart and imagination into it. Free your creativity and let yourself be inspired. . . starting with the products below! Two versatile varieties offer delightful and unexpected flavors. Enjoy 'em as glazes or jellies. You'll find many uses for our "glazellys". You've never had ketchup like this! Adds amazing flavors to most meats and seafoods. Our mustards will delight even the most sophisticated palate. Short on time? Our legendary pestos will make you shine. Dress up much more than salads! Alfredo, marinara, sundried tomato, and many more. Flavor-enhanced products that shorten prep time. This spicy concoction is a delicate balance of sweet and tart. It combines the flavors of subtle spices with that of fresh and dried fruits. Excellent as a condiment for wild game, turkey, beef and even sandwiches. When you think of peaches, the heart of the Texas hill country has some of the best peaches in the country. The luscious peachy flavor adds a wonderful rich fruit aroma and flavor to our chutney. It makes a wonderful condiment for pork, poultry, lamb or wild game. Spicy chunks of jalapeno and garlic make this jelly/glaze uniquely suited for southwest dishes. Especially good as a glaze on poultry and pork. This jelly has rich and floral mint flavor with just the right balance of sweetness. Enjoy with you favorite lamb dish, or create your own new standard. Jelly or glaze. The taste will enhance the natural flavor of meat, vegetables and soups. Great in oriental dishes. Simply this jelly is an excellent glaze as well as a jelly - hence the term "glazelly". Use on biscuits, to jazz up a peanut butter sandwich or to glaze poultry, duck and pork. This spicy concoction should be a winner with your family after their first taste. Our Chipotle Ketchup will add a great deal of zip and depth of flavor to all the dishes you add to it Of course, it is wonderful on your favorite burger and fries but experiment with this condiment: your palate is the only limited factor. Try with Chinese food with mustard and one of our pepper jellies or just add another depth of flavor to your favorite dip or dressing. I like to add just a touch to my vegetables when sautéing them. This can also double is a great hot sauce for your favorite Mexican dishes. This new product was inspired by the craze for hot peppers and spicy condiments. However, don't let the name 'habanero' scare you away. Yes, there is heat to this sauce, but we believe balance in all of our products is the key to success. Use in place of regular ketchup for a whole new experience with burgers and fries. The most outstanding use of this condiment is as seafood cocktail sauce. Use it on everything from fried shrimp and oysters to crab or catfish. We think you'll agree it is one of the best sauces you've ever tasted. An exciting new product from a blend of chipotle peppers, lime juice and spices. An ideal match for marinading most meats and seafood. This classic mustard is made with Texas hill country honey and imported dijon mustard. Try it with poultry and seafood or your favorite sandwich meats. This smooth and elegant mustard's rich sweetness shines through with every bite. Use on meats, sandwiches or in dressings and marinades. A European style mustard with a southern flair. Use it on your favorite sandwich or to enhance the flavor of dips, dressing or sauces. Also a great addition to many soups. This zesty whole-grain mustard has a deep rich flavor of roasted garlic with an underlying hint of raspberries and thyme. Use in dips, dressings, sauces. Enjoy the rich, smoky, earthen flavors without the intensity of heat that is characteristic of the chipotle pepper. Pepper aficionados will love the complex flavors that result from the blending of five dried peppers, a must for your condiment staples.5 pepper pesto adds great flavor to rice, pasta, and sauces. Substitute in your own favorite dip or marinade or accent an enchilada recipe. Add spice to beans or with your scrambled eggs, migas, soups, casseroles, or spike up a bloodymary. This pesto is excellent as a baste for char-grilling seafood pork, beef, chicken, and even vegetables. Texafrance 5-pepper pesto will add a smooth rich pepper taste to all your favorite foods. Our version of a classic sauce that can be used alone or bended with butter, sour cream or mayonnaise. Use over pasta or add to dishes such as rice, potato salad or soups. Add to hollandaise sauce, scrambled eggs, Bloody Marys, dips or dressings. Use as a marinade by coating chicken, fish or pork before cooking your favorite way. Cilantro Pesto is another unusual variation of the classic basil pesto. 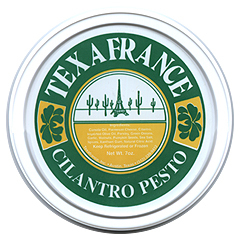 The strong flavor of cilantro is mellowed and enhanced by blending it with pumpkinseeds, walnuts fin cheese and oils. It can be used like all pestos, over pasta or as an accent to many dishes. Baste over grilled fish, chicken, pork, or add to their juices. 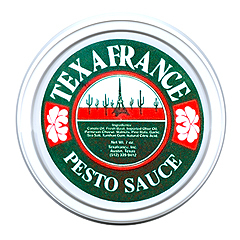 Combine in dressings, soups, marinades, and dips or add to rice or casseroles. 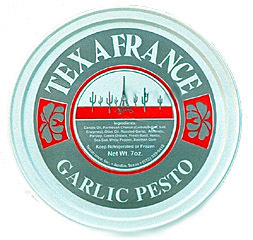 Texafrance garlic pesto is quickly gaining popularity among our loyal customers and attracting new converts every day. For those who love the taste of garlic this pesto is for you. Along with the wonderful qualities provided by the garlic, this pesto has subtle hints of basil and rosemary to round out the flavor. Uses are of course endless...pasta, rice, potatoes, beans, and vegetables using this pesto as a flavor enhancement. Try some with scrambled eggs hollandaise, soups, cassaroles, and in bloodymarys. Garlic pesto may be used as a baste for char-grilling seafood, pork beef, chicken, and vegetables. This pesto will add a marvelous garlic and herb flavor to all your favorite foods. Roasted Poblano Pepper Pesto is a unique blend of flavors that captures the rich tastes of the Southwest and a Thyme and Tarragon Pesto that is a variation of the classic pesto. Sun Dried Tomato Pesto has the rich and intense flavor of sundried tomatoes with the nutty flavor of pistachios and sunflower seed, fine oil, spices and cheese to give this pesto a very special flavor. Use with all kinds of pasta, baste over grilled or broiled meats or poultry. Add to dressings, soups, marinades, rice, stuffings, casseroles and dips for a daring difference. This is a grand version of a classic sauce, a blend of pine nuts, olive oil, rich Parmesan cheese, fresh garlic and basil. It can be used alone or blended with butter, sour cream or mayonnaise. Use over pasta or add to such dishes as rice and peas or potato salad, vichyssoise, tomato bisque, tomatoes and goat cheese in puff pastry. Wild Mushroom Pesto is a unique blend of flavors that captures the rich earthy tastes of wild mushrooms. Blended with the nutty flavor of pine nuts, balance with shallots, garlic, fine oils and Parmesan cheese, this pesto is probably the most versatile of all out pestos. The possible uses are endless. Add to eggs, stews, soups, sauces, rice and stuffings. This dressing is not your ordinary vinaigrette. This rich and piquant dressing is a light and refreshing blend of lime with an undertaste of basil…can be used in salads, just as is, or add sour cream or cream cheese for a dressing or dip. Also great as a marinade for fish, veal, pork, poultry or wild game. Our classic oil and vinegar dressing is as rich and inviting as what you have come to expect from our other products. We use the finest herbs, olive oil, vinegar, and parmesan cheese. May be used on a wide variety of salads. Add sour cream or cream chesse for a dressing or dip. May also be used as a base for marinades. 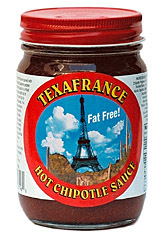 Texafrance is proud to produce a new time-saving product. This wonderfully rich oil combines canola oil with nutty overtones and savory mild garlic flavor. Use instead of butter, margarine or vegetable oil, or whenever garlic and oil are called for. Salads, stir-frys, marinate roasts, steaks, wild game and vegetables. Enjoy the fresh fruity flavor of our dressing. Great for dressing a fruit or spinach salad. Or create a tasty vegetable dip by adding sour cream. Also excellent as a marinade for fish, poultry and certain wild game. There are sweet and tart apple flavors combined with the fragrant aromas of fresh ginger and garlic. Great for all types of vegetable salads. . . also a nice addition to fruit salad; just mix with sour cream (non-fat, of course). This vinaigrette will also enhance the flavor of fish, pork or chicken when used as a marinade or a warm sauce. This dressing captures all the wonderful flavors of herbs and spices found in our classic French Vinaigrette, but with important differences. The flavors have been married together with the distinctive sweet flavor of fine balsamic vinegar to create a truly exceptional dressing. Even better, you can enjoy all this fresh flavor without adding to your daily intake of fat. Great as a marinade for fish, poultry, pork or beef. Also delicious served warm over wilted greens or leeks. Enjoy the piquant and refreshing flavors of fresh lime juice and sweet basil without adding to your daily intake of fat. Always an excellent marinade for fish, chicken, shrimp, and even cerviche. This fat free dressing combines the tastes of pure, rich honey with hearty Dijon mustard. These flavors are mingled together with the tart, fruity fragrance of lime juice and fresh ginger. A perfectly balanced dressing that's great warm or cold and is versatile enough to be used as a dressing, marinade, dip, or sauce. This creamy, rich tasting dressing has distinctive toasted sesame flavor with spicy overtones of Thai chilies and cilantro. This is combined with the subtle taste of ginger and garlic to give this dressing a perfect balance. Use it on your favorite salad or try a cabbage,cucumber, and radish salad for a change. This rich and fragrant tomato dressing has a unique blend of flavors paring tomato with pungent garlic and spicy Serrano peppers to create a versatile dressing that can be used on green salads as well as pasta and bean salads. Also works as a marinade for beef or pork. All these options without the added fat! This is a new and very versatile sauce that was inspired by a recent visit to the interior of Mexico. This delicious sauce has a base of tomatillos and tomatoes blended with rich, dried and roasted peppers and unique spices. The result is a spicy smooth sauce with a multitude of tastes and flavors. 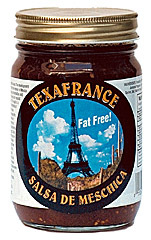 Eat it right out of the jar on chips or incorporate this sauce in your favorite Spanish or Tex-Mex dish. It does wonderful things to enchilada sauce; or add some to your favorite migas or just-scrambled eggs. Great over your favorite breakfast taco. Even good with fajitas! Enjoy the rich, smoky, earthen flavors paired with the intensified fire of the dried jalapeno pepper. For the pepper aficionado this sauce is a must for your cupboard. Eat it right out or the jar with chips or just add some zip to your favorite dip or marinade. You can spice up your favorite enchilada recipe or add some to beans or rice as well. Try some with your scrambled eggs or migas, soups, casseroles, even in a Bloody Mary. It adds an excellent touch as a baste for char-grilling seafood, pork, beef, chicken, and even vegetables. This sauce is guaranteed to give anything you add it to a nice spicy kick. The same rich, smoky, earthen flavors and jalapeno pepper fire as our Medium Chipotle Salsa (above), but with even more kick! Spicier, with even more bold flavors and heat. As with our medium-heat salsa, you can enjoy our Hot salsa right out or the jar with chips, or use it to add zip to your favorite dip or marinade. Spice up your favorite enchilada recipe. Add extra flavor to beans or rice. Try it with scrambled eggs or migas, soups, casseroles, even in a Bloody Mary. It adds an excellent touch as a baste for char-grilling seafood, pork, beef, chicken, even vegetables. Whenever you want to add a truly bold, spicy kick, this is the one to reach for. This classic sauce has been improved upon for quite some time in just about everybody’s kitchen. Well, this is our version and it’s true to form for the TexaFrance line. We use the perfect blend of cheeses and just the right amount of peppers and vegetables to offer you the best ready-to-use Queso on the market. 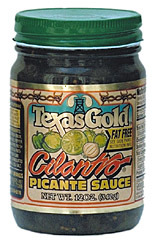 Enjoy with chips and salsa or as a condiment for any of your favorite Mexican dishes. Indulge yourself in this classic cream sauce. Traditionally rich, use it on pasta, vegetables and poultry. A classic tomato sauce with fresh ingredients brings you the real flavor of Italian cooking. Use generously on pasta or vegetables. A rich, sweet and tangy sauce great for all smoked or grilled meats. Used in restaurants to create delicious bar-b-que for you. A favorite among all of our products, this sauce was inspired by the popularity of sun-dried tomatoes. Sweet and earthy concentrated flavors of the sun-dried tomato along with fresh basil, garlic and herbs create a perfect sauce for all your favorite Italian dishes. A classic green sauce comes from a unique blend of fresh vegetables and spices. 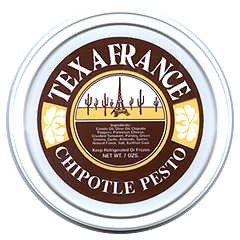 Use it in all southwestern dishes or just as a dip. 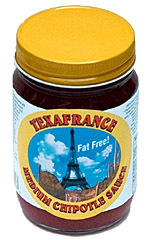 A unique fat free sauce with honey and mustard flavors that accent grilled or smoked meats. Try it with poultry or pork. A rich and robust steak sauce that enhances the flavor or any type of meat. Especially good on grilled or smoked meats. A classic Italian sauce, balances fresh vegetables and delicately flavored meats. 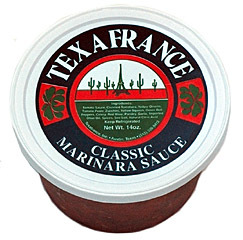 Canneloni cannot be served without this sauce! Also great on fish and poultry. 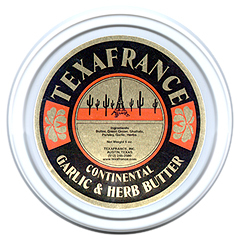 Continental Garlic Herb Butter is a very versatile butter that is delicately blended with garlic, shallots and spices. It lends itself to a number of uses. It can be used as a spread on garlic bread or steak, pork, chicken, or fish. 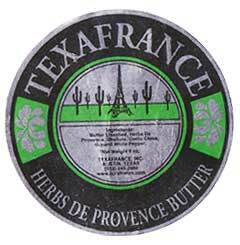 Add a taste of France using our butter that is delicately blended with Herbs de Provence spices. Use it to create flavorful vegetable dishes or as an addition to chicken or fish, baked or grilled. Our products make cooking easier, more convenient, and more delicious. One of the best ways to add more flavor is to stock up on our condiments, sauces, marinades, and dressings — any of these will make meals more exciting for the taste buds. Impress guests with your cooking by trying the recipes below or on our recipes page. Check back periodically as we will update these items from time to time. And don’t hesitate to email your favorite recipes via our Contact page. You may see them posted on our website! Braise To cook slowly in fat and a little moisture in a closed pot such as a dutch oven. Degrease To remove the fat, especially from meat broth or soup. One option is to put the entire dish in the refrigerator until the fat hardens, then remove the fat. Poach To cook in a simmering (not boiling) liquid. Sauté Cook diced vegetables or meat quickly in a small amount of fat over high heat. A flat bottom pan with low sides is used to sauté. Toss To mix together by gently lifting the ingredients, as opposed to stirring. •	Start with the best ingredients Fine ingredients add to the depth of the overall flavor. •	Switch to kosher or sea salt, and don’t be stingy with it Better tasting than ordinary table salt. •	Reduce liquids to concentrate flavor When braising, remove the main ingredient and continue to cook the liquid until it reduces. •	Let roasted meats rest before carving so the juices can distribute evenly before cutting, preserving the moistness. •	Add a final splash of acid (vinegar or citrus juice) to enhance the flavor of meats or vegetables. Let’s make it simple! Check out the easy recipes below, or send us one of yours. Cook a box of bowtie pasta. Drain the pasta and toss it into a bowl. 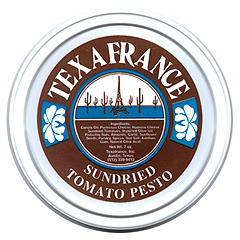 Add 1/4 cup prepared TexaFrance pesto, 1/2 cup of cream and toss in a bunch of baby tomatoes. One pot, one bowl, one delicious dinner! Cook your favorite pasta. 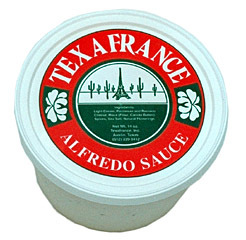 Drain and add any TexaFrance pasta sauce. Top with steamed sugar snap peas and fresh basil. Yum. Cook rice as you would normally. Gently stir in ½ cup of TexaFrance Mushroom pesto. Top with roasted walnuts or pecans. Grill chicken pieces until done. 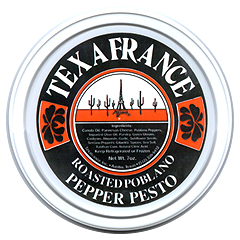 Remove from grill and brush with TexaFrance Pepper Lime Jelly for a sweet and spicy finish. Place a round of brie on a serving dish and top with TexaFrance Peach Chutney. Surround with crackers or toast points and enjoy. Unroll dough; separate into 4 rectangles. Firmly press perforations to seal. Unroll dough; cut into 4 rectangles. Spread 1 tablespoon cream cheese over each rectangle, to within 1/2 inch of edge of 1 short end of rectangle. Stir vinegar into chutney. Spread 1/4 of chutney (about 1 tablespoon) over cream cheese on each rectangle. Starting at short end covered with cream cheese, gently roll up each rectangle. Pinch seam to seal. Place rolls on cutting board or large plate; cover with plastic wrap and refrigerate 20 minutes for easier slicing. Heat oven to 375°F. Line 2 cookie sheets with foil; spray foil with No-Stick Cooking Spray. Cut each roll into 8 slices, using serrated knife. Place on cookie sheets. Bake 12 to 15 minutes or until golden brown. Immediately remove from cookie sheets. Serve warm. In a small bowl, combine rice wine vinegar, pepper jelly, lime juice, onion, salt and pepper. Whisk until the jelly begins to dissolve. Slowly add the oil, whisking until it all combines. Set aside. Toss chicken breast with lime zest, lime juice, a little honey, 2 cloves of garlic, salt and pepper, and a little olive oil. Wes grilled it while I put the salad together. Toss the watermelon, greens, blue cheese, and pecans. Drizzle dressing over, or toss. Slice chicken and serve on top. 2 tablespoons mayonnaise 1 tablespoons lemon juice Salt and pepper Mix all the ingredients in a small bowl and season with salt and pepper. The sauce can be held in the refrigerator for 1 week. Pesto Pizza Split a loaf of French bread and brush with pesto. Top with pepperoni, shredded mozzarella and grated parmesan. Broil until the cheese melts. Italian BLT Spread pesto mixed with mayonnaise on toasted bread; fill with crisp pancetta (or bacon), sliced tomato and arugula. Pesto Corn Grill or steam corn, then brush with Pesto Butter. Sprinkle with parmesan. Cube the fish and assemble kabobs. Alternate onion, fish, oyster, shrimp and cherry tomato. Repeat on each skewer. Place the full skewers in a deep dish and pour TexaFrance Basil-Lime Vinaigrette over them. Marinate 1 hour. Cook on hot grill for approximately 2 minutes on each side. Go simple and delicious with this recipe. Toss grilled asparagus with your favorite pasta and then pour on heated TexaFrance Sun Dried Pasta Sauce. You can use any vegetable that’s in season. Give it the taste of Autumn with squash, or think Mediterranean with artichokes.